The Phisco electric shaver is a premium category product with a distinguished design and unique features that will provide you with a shaving experience like no other. It has a modern design and a good weight and when holding it in your hands, you can feel that this is a high – value product. Just having a look at the shaving head can show how different it is than anything else we have seen in the market. The Phisco floating dual track shaving heads are 3D rotary style heads which are designed for a close and clean shave. The dual track blades conform to your facial contours and make it comfortable to get rid of hair even at the tough-to-reach places. It gently follows the curves of your face and the concave blades allow you to have an even closer shave. 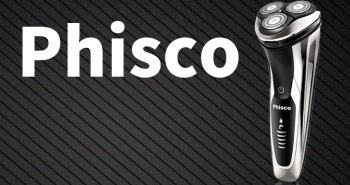 Phisco has self-sharpening precision blades which are gentle to your skin and provide a fast and efficient shaving without pulling on the hair. 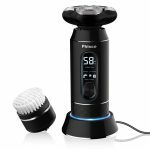 The Phisco Electric Shaver comes with a facial cleansing brush which you can swap with the shaving head with just easily clicking it in its place. The brush allows you to efficiently cleanse your face and get rid of the dead skin cells. It will definitely leave your skin with a fresher feeling than simply washing it with your hands. The Phisco Electric Shaver is completely waterproof and cordless, designed with the Advanced IPX7 Waterproof System so you can have both a wet and dry shave depending on your preferences. If you are in a hurry, you can just quickly shave your face dry, but if you are one who enjoys shaving with gel or foam, that is completely fine as well. What more, you can bring this shaver with you to the shower. The entirely waterproof body of the shaver also makes cleaning easier. 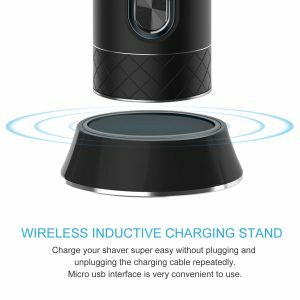 The Phisco shaver comes with a wireless inductive charging stand which is very convenient when you don’t like your shaver lying around the room or in the bathroom. This one has a clean look and no annoying cables lying around. The shaver itself has a LED display which not only shows the charging time, but also reminds you of when to charge and clean your machine. Apart from this, it has a travel lock which makes it more convenient to bring your shaver with you on a trip. You can use this shaver for up to 60 minutes without charging, which is quite good considering that you can easily place it back to the charging unit after each use. 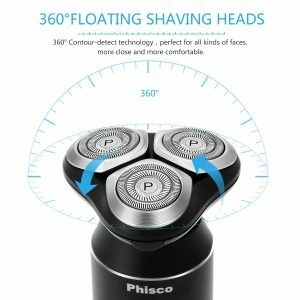 The Phisco shaver has an extremely powerful motor, the rotation speed of this razor is 3000 RPM which is 35% more powerful than electric shavers in general. This means that you can have a faster shave, so you will probably not use those 60 minutes to get rid of all the hair on your face. The Phisco shaver comes in a very stylish box, a real prestige piece which is just a joy to open. The hard box that it comes in can even be used for transportation. The shaver comes with it’s original 3D rotary head and a replacement click-on cleaning brush head with a protective cap. The box also has the charging unit, charging cable, cleaning brush and a pouch to keep everything in.